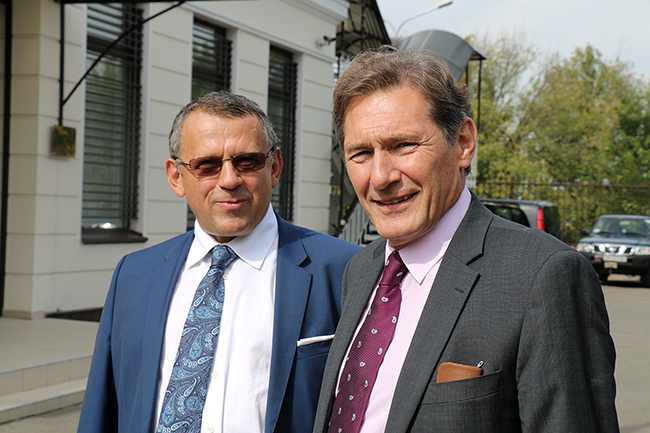 On September 16th, the European Union Advisory Mission Ukraine welcomed the Political and Security Committee delegation from Brussels at the Mission’s Headquarters in Kyiv. Besides a warm welcome, the ambassadors from 28 European Union Member States were updated on the work of the Mission and the level of engagement with Ukrainian partners. The Head of EUAM, Kalman Mizsei, briefed them on strategic and tactical EUAM activities. He highlighted the successful model police station concept developed by the Mission’s expert which has been initially launched in Sambir (Lviv region) and has already been spread to other regions by the Ministry of Internal affairs. Mr. Mizsei also informed the ambassadors on EUAM’s support to prosecutorial reforms and the observation of the recruitment process for local prosecutors. “For the first time, Ukraine has a transparent selection process of prosecutors. EUAM is supervising and observing this process together with NGOs. Ukraine’s success in state building and supporting reform is a very important, it is a core European issue,”said Kalman Mizsei. “The reforms at the strategic level in Ukraine are not enough for the sustainability of the country. The process should go parallel and meet also the expectations of the regions. EU experts should work with local police stations and courts to ensure that their advice given in the centre is transmitted to the regional layer,” underlined Kenneth Deane, EU’s Civilian Operations Commander who was also present. “The EU Advisory Mission is an important element of EU’s support to Ukraine, particularly in the civilian security sector and rule of law, where reforms are very much needed. It not an easy task. I want to pay tribute to all members of the EUAM working in the regions of Ukraine,” concluded Walter Stevens, Chairman of the Political and Security Committee.